Compare and contrast regional security architectures in Asia and Europe. While all other major theaters have had pan-continental settings in place already for many decades, such as the Organization of American States, African Union, and Council of Europe and Organization for Security and Cooperation in Europe, Asia is rather different. What becomes apparent, at first glance, is the absence of any pan-Asian security/multilateral structure. Prevailing security structures are bilateral and mostly asymmetric. They range from the clearly defined and enduring non-aggression security treaties, through less formal arrangements, up to the ad hoc cooperation accords on specific issues. The presence of multilateral regional settings is limited to a very few spots in the largest continent, and even then, they are rarely mandated with security issues in their declared scope of work. Another striking feature is that most of the existing bilateral structures have an Asian state on one side, and an either peripheral or external protégé country on the other side which makes them nearly, per definition, asymmetric. The examples are numerous: U.S.-Japan, U.S.-South Korea, U.S.-Singapore, Russia-India, Australia-Timor-Leste, Russia-North Korea, Japan-Malaysia, China-Pakistan, U.S.-Pakistan, China-Cambodia, the U.S.-Saudi Arabia, Russia-Iran, China-Myanmar, India-Maldives, Iran-Syria, North Korea-Pakistan, etc. 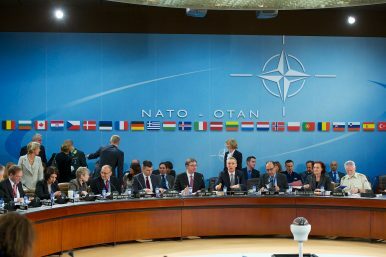 With Brexit in the United Kingdom and the “America First” foreign policy in the United States, assess the future of NATO. The West is apparently in a serious decline. The U.K. has been sliding down for 100 years, absorbing it by a skillful set of planetary contrasts. The U.S. has been melting ever since the end of World War II. In 1945, Americans had 54 percent of global manufacturing output; today it is hardly a third of it. NATO is a relic of Cold War instrumentality. Currently, confrontational nostalgia is what keeps it afloat. The transatlantic world is overcommitted and overstretched. London and Washington understand that NATO increasingly becomes part of a problem, not a solution, for their own future. Europe goes along with it. Simply, the Old Continent is not a wealthy club anymore. It is a theater with a memory of its wealthy past. The EU has to learn how to deescalate and compromise. This is in its best interest, for the sake of its only viable future. Is an Asian version of NATO plausible? The world’s largest continent must consider creation of a comprehensive pan-Asian institution. Not a military pact à la NATO (since NATO is only an instrument of American military presence in Europe) but a true multi-vector and multilateral instrument. Prevailing security structures in Asia are bilateral and mostly asymmetric, while Europe enjoys multilateral, balanced, and symmetric setups (the American and African continents too). In my forthcoming book No Asian Century, I go as far as to claim that irrespective of the impressive economic growth, no Asian century will emerge without creation of such an institution. Asia today is a huge running water without clear river banks – a rising economic success, social volcano, and political hazard. Identify three ongoing geopolitical risks that Asia and Europe share. For most of the 19th and a good part of 20th centuries, a central question of Europe and the Euro-Atlantic was how many “Germanys” Europe can digest – one big, over-potent and omnipresent or several Germanophone states in a dynamic equilibrium with itself and the rest. This and the so-called the grand accommodation – Germany with Russia or France with Russia – remains a central security consideration for many decades to come. On the other flank of the world, the entire Asian architecture was based on an assumption of a weak center; a fragmented, backward, and soft mainland China. What we are witnessing now is the awakening of China – reminiscent of an imperial Germany in the heart of Europe. What common linkages underpin U.S. transatlantic and transpacific relations, and how should the U.S. administration capitalize on them? The Chinese grab for fossil fuels or its military competition for naval control is not a challenge but rather a boost for the U.S. Asia-Pacific – even an overall posture. Calibrating the contraction of its overseas projection and commitments – managing the decline of an empire – the U.S. does not fail to note that nowadays half of the world’s merchant tonnage passes though the South China Sea. Therefore, the U.S. will exploit any regional territorial dispute and other frictions to its own security benefit, including the cost-sharing of its military presence with the local partners, as to maintain its pivotal position on the maritime edge of Asia that arches from the Persian Gulf to the Indian Ocean, Malacca, the South and East China Sea up to the northwest-central Pacific. A real challenge is always to optimize the moral, political, and financial costs in meeting national strategic objectives. In this case, it would be a resolute Beijing’s turn toward green technology, coupled with the firm buildup of Asian multilateralism. Without a grand rapprochement to the champions of multilateralism in Asia, which are Indonesia, India, and Japan, there is no environment for China to seriously evolve and emerge as a formidable, lasting and trusted global leader. Consequently, what China needs in Asia is not the naval race of 1908, but the Helsinki process of 1975. In return, what Asia needs from China and Japan is the “ASEAN-ization,” not the “Pakistanization” of its continent.